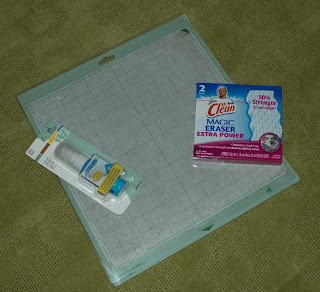 Are you wondering how to clean your Cricut cutting mat when it looks like it’s time to toss it in the trash? I’ve got a better, more budget-friendly, solution! There are so many different ways you can clean and restick your Cricut cutting mats (or any cutting mat for that matter), so I have narrowed them down by the ones that actually work. Before you begin cleaning your mat, I would highly suggest investing in a scraper tool, if you don’t already have one. These will help you maintain your mat over time, causing less damage to the adhesive. This is a technique I only use when absolutely necessary because it can get a little messy and is a little more tedious. The supplies you’ll need for this are Goo Gone, Easy Tack, painter’s tape, and an old toothbrush/scrubber. You’ll first line the outside of your mat with painter’s tape because you will be applying a spray adhesive that you don’t want to spread to the outsides (I know this from experience). Then you’ll apply the Goo Gone and scrub off all of the adhesive with an old toothbrush or scrubber of some sort. You’ll then wipe down your mat thoroughly, and let dry before spraying with Easy Tack. *Be sure you let it air dry completely before using the mat! I recently did a Knockout letter project with construction paper that left a lot of residue on my mats. The Easy Tack works like magic. Everytime. Here is a great video to show the process. All you need for this technique are Totally Awesome Cleaner and a scraper tool. This is probably my favorite technique because it is so easy, and makes your mat like NEW again. You simply spray down your mat with the all-purpose cleaner, scrape off the residue, then wipe it down. So simple, right? And it works VERY well! The only supplies you need with this resticking technique are Tack-It, a foam brush, and painter’s tape. This is a simple technique that is great for very worn cutting mats. You remove the adhesive from the mat with your scraper tool, then apply a generous coat of Tack-It to your mat. I like to outline my mat with painter’s tape so it’s less of a mess to clean, but that’s up to you. See the complete tutorial here or watch the video. The only supplies you need with this technique are Elmer’s Craft Bond and painter’s tape. This is a technique similar to applying the Easy-Tack, just with a different adhesive. The benefit to using Elmer’s craft bond is that is dries very quickly, unlike Easy-Tack. Simply edge your mat with the painter’s tape, then lightly spray the adhesive onto the mat. Watch the video tutorial if you are having trouble with this technique or the spray adhesive itself. This is another simple way to clean your Cricut cutting mat. All you need are a magic eraser and a Zigs Glue Stick. You just clean the cutting mat with the magic eraser, removing as much of the sticky residue from the mat as you wish. You then apply a coat of the glue and let completely dry. This is a very easy way to really get a good stick for mats that are pretty worn. I use this technique if my mat has very little stick left and it works perfectly! First, make sure that you have scraped the leftover scraps off of your dirty mat–get everything lose that you can. I always use my scraper tool to do this. Then you can grab a couple of Clorox disinfectant wipes, and wipe away! The wipes will make your mat sticky again, as long as it isn’t overly worn. With this technique, the only thing you need is a lint roller and a pack of alcohol-free baby wipes. This is a super easy way to clean up those dirty mats, and is especially perfect for mama’s with babies in diapers! To clean the mat, just wipe it down with the baby wipe and use a lint roller to roll over any unwanted paper scraps stuck on your mat. I also love lint rollers for tedious weeding projects. This is the best way to preserve your Cricut cutting mats, by far. I always rinse mine off in the sink after use, lightly rubbing with warm water and dish soap occasionally. This is an inexpensive way to keep your cutting mats clean, allowing them to last longer. If you like freebies, you’ll love this tutorial on uploading your own FREE fonts to Cricut Design Space! Don’t forget to follow my board on Pinterest for future money-saving hacks!